Installing software on Linux is very easy. Almost every Linux distribution uses a so-called package manager, similar in some way with an App Store. Unlike Windows and OS X, it is usually not necessary for Linux to scour the Internet looking for the proper installation file for your desired software. If you just tell your package manager which software you are looking for, everything will be installed automatically. To make optimum use of the opportunities, it is important that you know which package manager software libraries ( “repositories”) can be used. Every Linux distribution uses its own package management system and therefore has its own software libraries. The lack of unity in this area will work in this guide explain how to put the package manager of most common Linux distributions and what software repositories can be an addition to the repositories that are by default activated on your Linux-distribution. The vast majority of all software can be found in repositories, but not all. Additionally there may be reasons to install software manually. Sometimes you can find a file that is not in a repository is still install with your package manager, with the advantage that you can exclude conflicts between software versions and always quickly retrieve a list of all installed software. It is usually from here .rpm or .deb files. Sometimes there is no ready file available that you can install, but only a source code or source code from a file. These are usually files ending in .tar.gz or .tar.bz2. These are zipped files containing the source code of the software. To work with the software, this code will be converted into bits and bytes so that you can run the software. Yum is one of the most popular package managers and is used in Fedora (t / m version 21), CentOS and Red Hat Enterprise Linux. It is an indispensable tool to manage your system. Not only for installing new software, but also in updating and maintaining your system and to prevent different versions of your operating system and softwarepakketten- conflict with each other. Yum namely maintains a database where all information is stored on your software. A precondition here is that you install any software with Yum or manually through .rpm files. RPM (Red Hat Package Manager) is the format in which Linux files are available for Red Hat-based distributions like Fedora, CentOS and RHEL. It can be seen as a kind of precursor of Yum and uses the same database as Yum. Software that you install manually using an .rpm file is therefore to maintain with Yum. Yum is a tool for the command line but works very simply. Some of the basic commands are enough to manage the vast majority of your software. Dozens of other commands are occasionally used. This page will explain the most common yum commands. For a more detailed manual on Yum please go to this page. Below are the most common commands for yum. The commands must be executed in a terminal with root privileges. Is that not all the information you need? Take a look at our special page on Yum . Works with your Linux on the desktop and you would like a nice program which you can install and manage without all sorts of commands software? If your Fedora, CentOS or RHEL used a graphical desktop environment, you can from your menu select ‘Software’. If this option is not there? Then you will need to install the software package gnome-software via the command line. To do so, open a terminal window, enter the command ‘su’ to obtain system privileges, and then enter the command “yum install gnome-software ‘. This command is executed successfully? You can then still run the software program from your menu. In Fedora 22 and later versions will instead Yum be used DNF (dandified yum), an enhanced version of Yum. In the future, RHEL and CentOS will most likely change to DNF. The operation of this program is almost identical, but there are some differences under the hood. Red Hat was one of the first players in the Linux world. In 1997, Red Hat launched a package management system, the Red Hat Package Manager (RPM). Until then your operating system consisted of separate software packages all of which must be maintained separately. There was no central database that tracked was what software was installed on your system. Because Linux is very modular, that is a very awkward situation. With RPM was resolved. Since then, many software is also released in .rpm format. 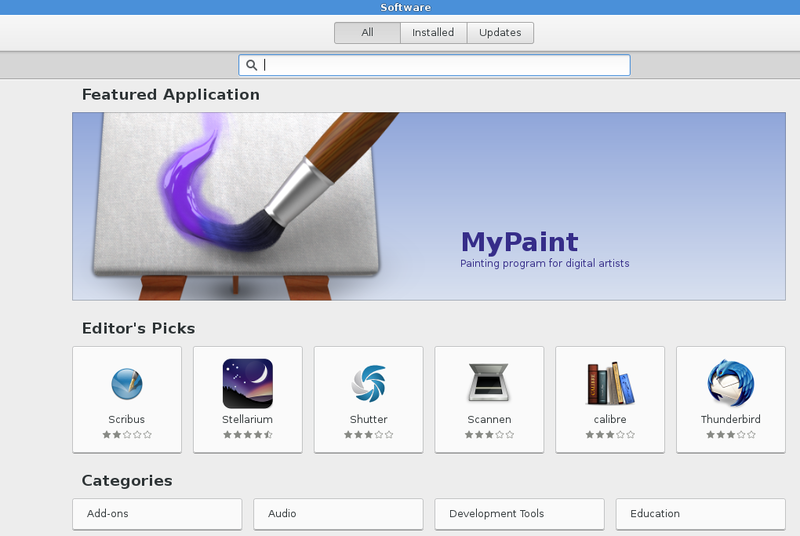 When it comes to open source software, it is possible in many cases to which software easily from a repository ( “software library”) to download Yum . Do you have software found in .rpm? Then you can install it in two ways, namely via the command line or by simply clicking on your rpm file. The last way does not always work smoothly, but if it works, it requires no further explanation. If it does not work, you will still have to take your loophole to install the .rpm via the console. The above command consists of two parts: the part rpm -qa the full list of installed software is displayed and the part grep software you ensure that only display the lines from that list which the term software occurs. Ubuntu, Linux Mint and a few other distributions originally based on Debian can not handle yum / dnf or .rpm files but use apt and .deb files. Installing software on these systems can gangbbare two ways: through Apt and manually with dpkg. Apt stands for A Package Tool, and was the first package tool for Linux that was able to manage software packages and resolve dependencies and conflicts between software packages and versions. Apt is still used as a package manager. Manually install .deb files can of course, this goes with the command dpkg , an acronym for Debian package . The following are two options for installing software on Ubuntu, Linux Mint, Debian or derivative thereof explained distribution. Although the command line sometimes afschikt, apt-get is designed for simplicity and makes managing your software collection indeed much easier. Apt standard uses several software libraries that are maintained by the maker of your Linux distribution. It is possible additional software libraries here, in other words repositories to add. Thus, you can install more software. See the repositories page for more information. You can also install software by self compile (or at Lower English: compiling). Compiling software is sometimes necessary to open source software, namely, if the software can not be installed with yum, dnf or apt-get and if there is no suitable .rpm or .deb file. Compiling or compiling software is converting to computer programming language, ie zeros and ones and can only from the console. When you open the console, it will need to be unzipped the downloaded software package as a first step. TIP : You can type in most cases only the first letters of the folder you want to open and then press <Tab>, the rest of the name is automatically replenished. Now if you get error messages you should probably install another program that is needed for the program that you want to install. The options are too numerous to explain here. You can not get out, we’re glad to help on the forum Alleslinux.com or contact us for professional support . Again, it is important that you check for any error messages. Is not that the case? Then install your program. You’re logged in as root. By exit typing, followed by enter, you are logged out again as root. Do you want to continue working in the console? You can. For example you can try whether the newly installed program works by typing the program name and pressing enter. Will not you continue? Then type again Exit to close the console. You can find a program that you’ve compiled also remove himself again, but only if you did not remove the source folder. Therefore it is wise to always move the sources into / usr / src. The sources are then in a central location. To remove a program, go to the source directory, which is the folder where you’ve done during the install “./confige ‘,’ make ‘and’ make install ‘. You must be in the source directory, the command ” make uninstall ” types to remove a program. Do you have questions about installing software? Then you can always visit the forum AllesLinux.com . Want to do install software, you can enable AllesLinux.com before. Check our support page for more information. Do you have less hurry? Then consider to enroll in a course Linux !